If you love comfy cotton sheets and your bedroom is outfitted in a casual style, you're sure to love the Graydon Mélange sheet set made for Ralph Lauren by Trident. 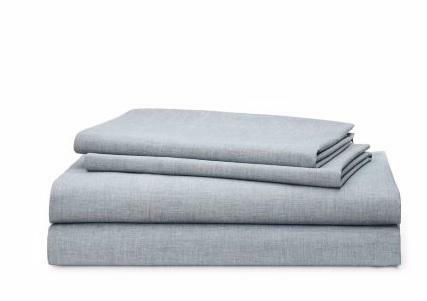 As their RalphLauren.com product page states, these sheets will "get softer and more comfortable with each wash, just like your favorite chambray shirt." As one who ordinarily uses jersey sheets during the warmest months of the year, I was a little skeptical about whether these sheets would live up to their billing. I often find cotton sheets to be scratchy and uncomfortable, even after they have been washed several times. However, any concerns I had in that area were set aside from the very first use. Just like the product description says, these 144 thread-count, 100% cotton sheets are extremely soft and super-comfortable. Apparently, I have just not used the right kind of cotton sheets in the past. These are absolutely wonderful! I did wash the sheets one time before using them, so I am not certain if they would feel as great right out of the package. What I can say with certainty is that after just one wash, these are the most comfortable cotton sheets I have ever used. Not only do they feel great, these sheets are also very attractive. They look broken-in, but do not look worn out. That's because they are yarn-dyed, which gives them a casual, textural look that is ideal for a room outfitted in a relaxed style. For example, they are perfect for beach theme or nautical bedroom decor, as well as other casual styles. Six colors are available, so you can find the perfect fit for your bedroom decor and color scheme. Color options are: chambray (light blue), indigo (dark blue), fog (gray), dune (sandy beige), white, and red. These sheets are available in sizes to fit most beds: twin, full, queen and king. Each set includes fitted and flat sheets plus two pillowcases. The king size includes king pillowcases and the other sizes include standard pillowcases. If you are looking for cotton sheets that feels as great as they look, chances are you'll fall in love with these! Note: The author received a set of these sheets to review at no cost. The opinions shared here are her own.